For those of us involved in the production of the Montana Journalism Review, we awaited Thursday night with baited breath and no small amount of tense hesitation. 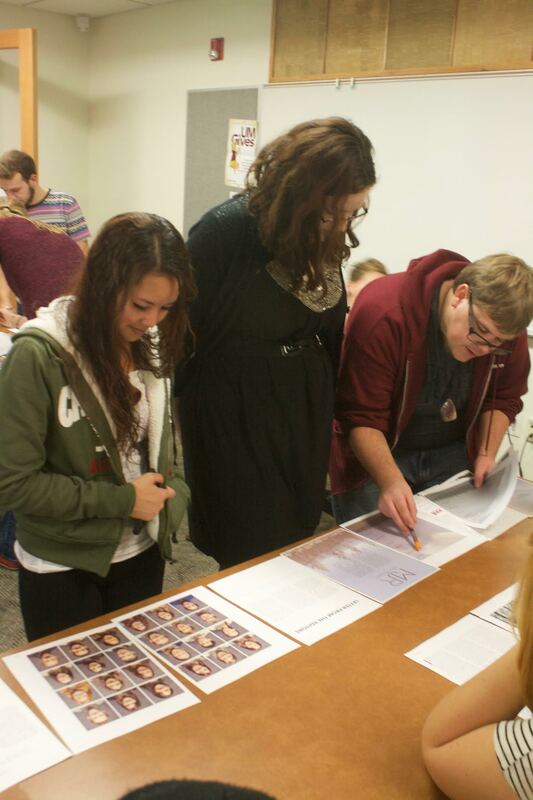 The Montana Journalism Review, affectionately called MJR around the Journalism building, is an annual publication produced entirely by students. The magazine covers media in the West, with an eye towards critiquing our professional peers. This fall’s team brought high aspirations to design quality, photography and writing. 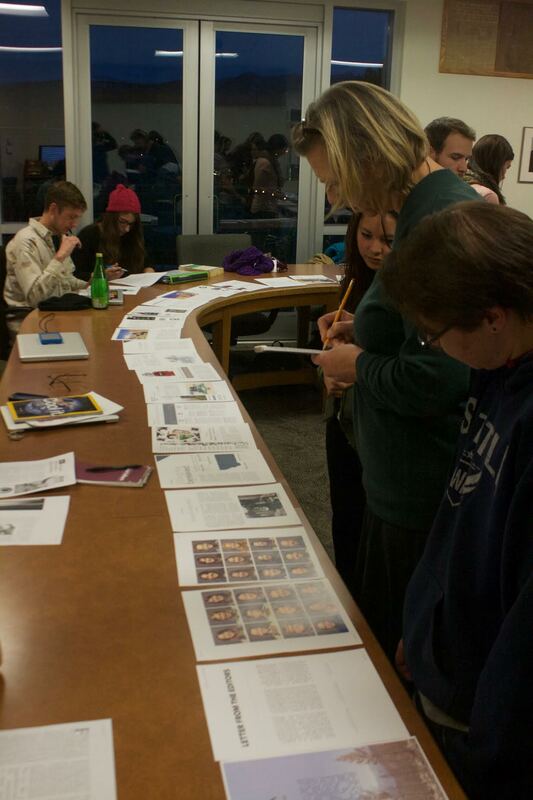 Thursday evening, a semester’s hard grind came to a head with the dreaded ‘copy slam,’ when printed out drafts of each fully designed page of the magazine were laid out in a long line, to receive excruciating scrutiny by our team. The copy editing crew dives deep into every page, even the table of contents and staff portrait ones. Photo by Andrew Graham. I’d heard nightmarish tales of copy slams that last well into the night, and fueled up with pizza and coffee accordingly. But when I arrived, the excitement of seeing our magazine laid out in full color quickly swept away the dread. The next few hours passed quickly, between hard work and excitement, as I dissected my story as well as stories from other authors. As staff writer, I’d been responsible for producing the cover story; a feature piece on the way western media covers wildfires. My MJR experience was both challenging and rewarding, and I decided to check in with a few of my classmates about theirs. Two of our senior editors; Erin Loranger, 21 and a senior, and Taylor Wyllie, 20 and a junior, rested their backs against the wall in a corner of the room, pages splayed out across their laps and the floor. Two big traveler boxes of Starbucks coffee steamed gently on a table nearby. All semester Taylor and Erin have been balancing their jobs as MJR editors with being editors of the Montana Kaimin, the weekly print and daily online student newspaper. It’s been a tricky tight rope to walk, and I asked them how they’ve enjoyed the feel of working on a magazine as opposed to the newspaper. “It’s nice to have the time to work with reporters through multiple drafts,” Erin said. MJR stories go through several rounds of edits, fact-checking and copy editing, something that would be impossible for a weekly newspaper or breaking news online article. “It’s been really cool to work with these professional journalists that have different expertise,” Taylor added. At the Kaimin, they supervise student reporters. MJR, however, draws content from a wide range of contributors, and Taylor and Erin must edit writers who have been in the game far longer than they have. Page by page, faculty advisor Henriette Lowisch and members of the MJR staff go through their magazine, looking for errors in copy or design. Photo by Andrew Graham. On the far side of the room the copy-editing team huddled in a bunch. For them, the last few weeks have been one continual copy slam, as the stories they’ve been waiting for all semester came flooding in from writers and editors. Every fact, quote and detail in each story had to be thoroughly fact-checked. That means sources had to be called anew, stories corroborated and statistics rechecked or calculated again and again. To give a sense of what a challenge this could be, the story I wrote contained quotes from twelve different people and even more written sources. There were several scenes where details had to be reconstructed and corroborated, and facts pulled from fire reports, journal articles, newspapers and TV broadcasts, all of which had to be confirmed. There are several other feature length pieces as well, and all the stories in the magazine reflect deep reporting. In the end, the ‘copy slam’ didn’t take too long, at least for me. We made sure every story, design element and advertisement (sold to businesses by our staff to fund the magazine) were looked over by many pairs of eyes, and most of the team headed out. I’d put in my long nights trying to meet deadlines at the beginning of the semester, so I didn’t feel bad when I waved goodbye to the senior editors as they settled in to make the changes we’d marked, adjust designs and go over every piece and page with a fine tooth comb, several times. 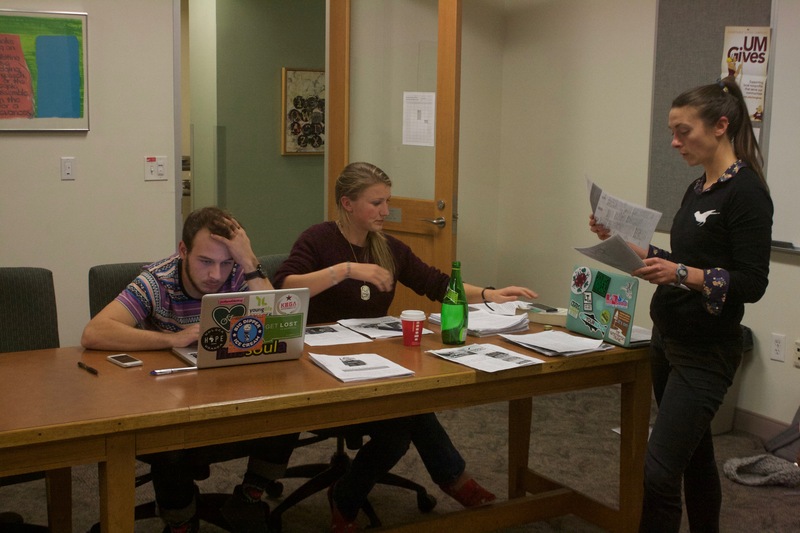 Editorial Managing Editor Nicky Ouellet, Copy Chief Reagan Colyer and Staff Photographer Jake Green settle in for a long night as the rest of the team files out. Photo by Andrew Graham. The magazine won’t go to the printers for another two weeks, and won’t be distributed until December. For those of us involved in its creation, that stretch until we see the fruits of our labor feels like a long one. While I feel for those of my team on the production side of things, for this writer it’s time for a long exhale.